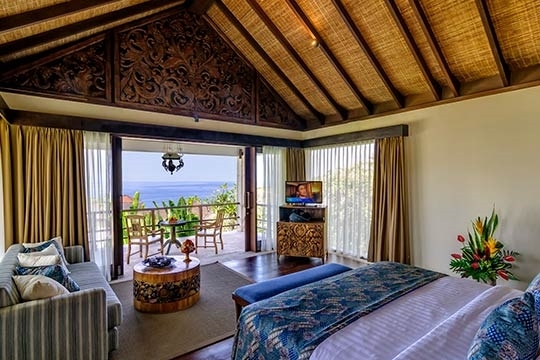 Spectacular sunrises, luxury living and secluded beaches define Villa Cantik. 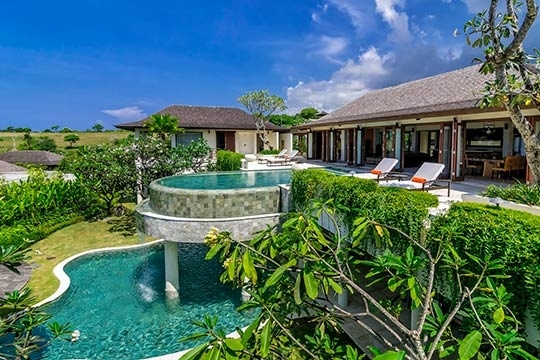 Situated atop a forested bluff on the Bukit Peninsula in south Bali with 180-degree ocean views, this 2-pool, 6-bedroom fully staffed luxury villa has it all. 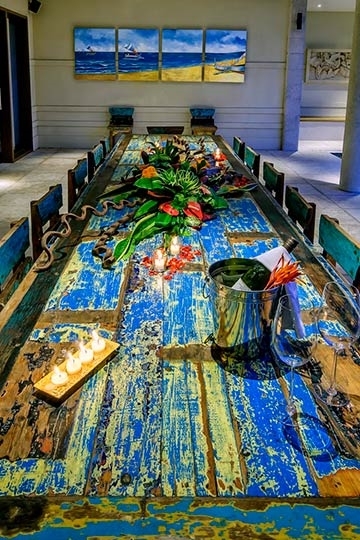 It’s the perfect getaway for families, groups of friends or colleagues on work retreats. 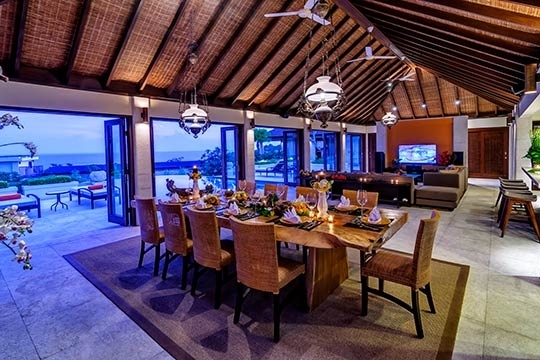 Splendid sunrises and panoramic views that stretch to the horizon are displayed for your enjoyment at this six-bedroom luxury villa by the sea. 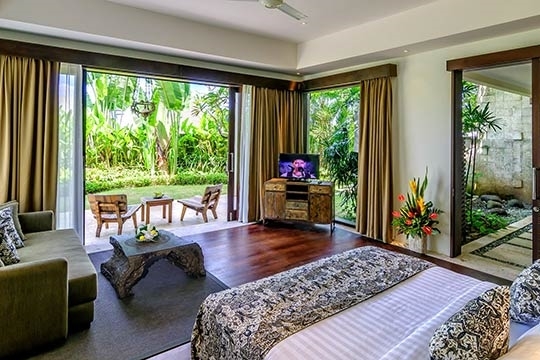 Set in the exclusive Gapura Vista complex just moments from the white sands of Pandawa Beach, Villa Cantik is a hard-to-beat choice for those looking to escape and unwind in a refined atmosphere. 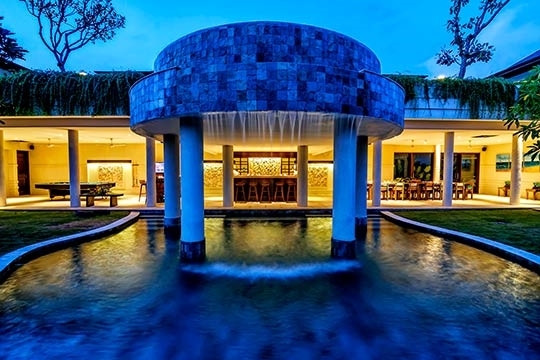 This unspoilt region of Bali is worlds apart from the hustle and bustle of the island’s more touristic destinations, yet is less than 20 kilometres from its international airport, and within quick reach of many south Bali attractions. 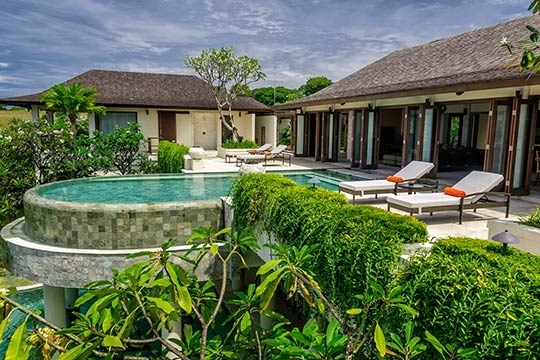 Guests can enjoy pristine, secluded beaches; rounds of golf on perfectly manicured courses overlooking the sea; designer boutiques and heavenly spas in nearby Nusa Dua, or sunset ‘fire dances’ at the dramatic cliff-top temple of Uluwatu. 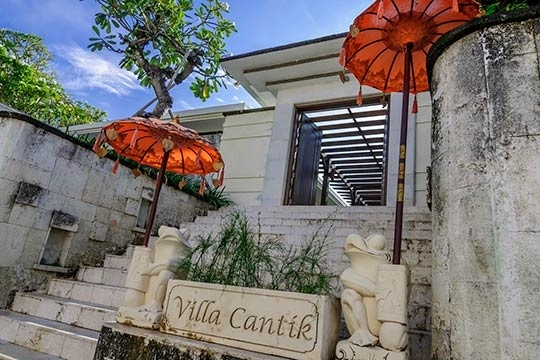 For those more inclined to lounge in the lap of luxury, Villa Cantik offers the best in contemporary design with a team of experienced staff who serve with a smile. 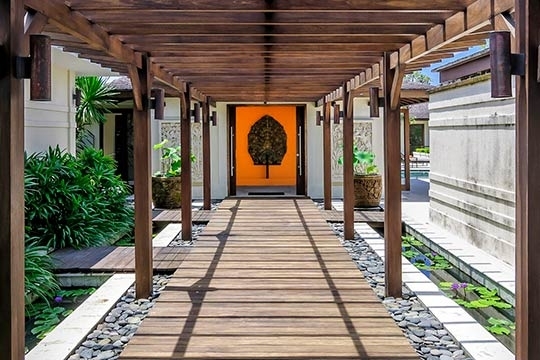 At Villa Cantik, spacious indoor living areas merge seamlessly with an upper level veranda that extends to a 8-metre pool overlooking lush Balinese gardens. The six-ensuite bedrooms, private gym and media room are connected through a network of textured marble corridors kept cool by coastal breezes. The immense living room, kitchen and dining room areas share a comfortably furnished space that blends contemporary style with home accents crafted from natural materials. At ground level, a second uniquely designed pool captures the crystalline cascade from above. 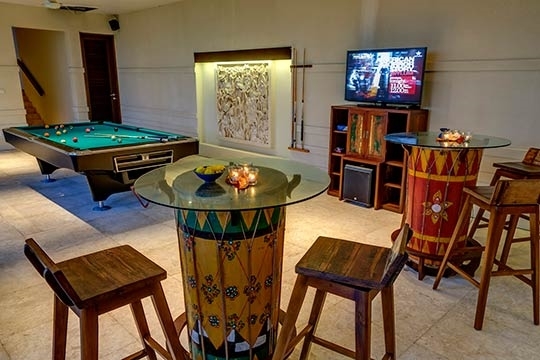 This area is marked by a billiards table, full service bar and outdoor dining with seats for 20; great for entertaining. A luxury villa is not complete without a team of caring staff. 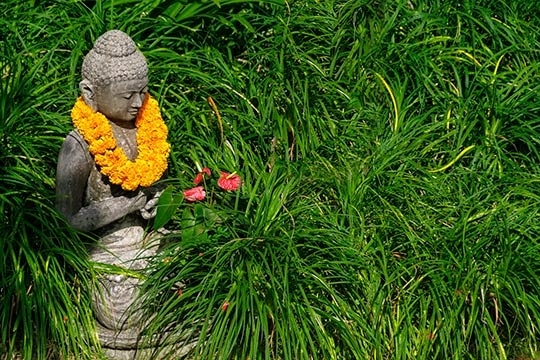 You’ll find exactly this at Villa Cantik. 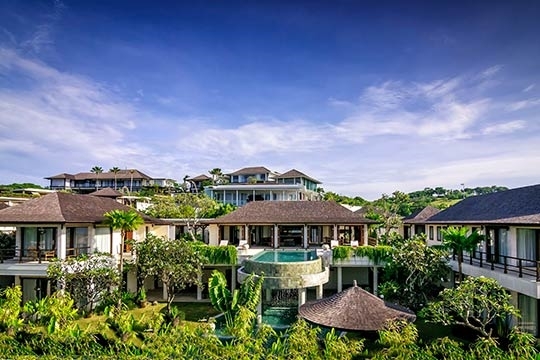 The knowledgeable villa manager can arrange transport, island tours, restaurant booking and sports activities including golf - or even paragliding over Bali’s dramatic southern cliffs. And with five butlers who also serve as personal chefs, guests are well looked after during their stay. Villa Cantik is perfect for families on holiday with older children, groups of friends celebrating or colleagues on a work retreat. Blissful sherbet-coloured sunrises and 180-degree ocean views. 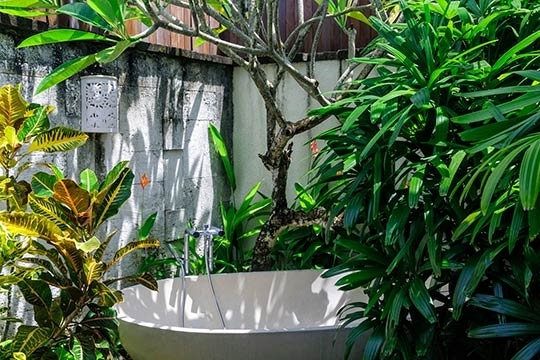 We were looking for somewhere to get away from it all, and Villa Cantik was the perfect choice. Waking up to those brilliant sunrises over the ocean was a wonderful start to each day. Coastal breezes carried the heady scent of frangipani and the early morning birdsong was yet another pleasant reminder of the distance between over-crowded Kuta and us. 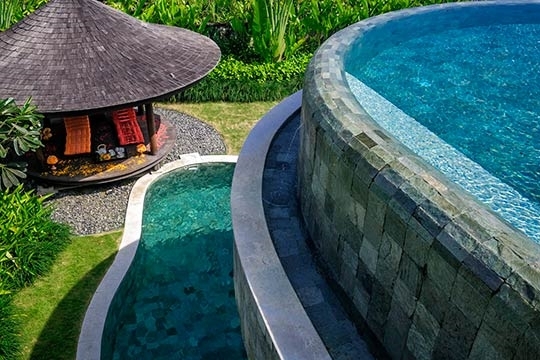 Although there’s plenty to do in south Bali, we opted to spend our days at the villa, swimming in the two pools, lounging in the sun, playing billiards and visiting the gym when guilt set in. The staff were incredibly accommodating. We would climb out of bed to enjoy a coffee by the pool and return to see our room freshly cleaned and tidied. Since Villa Cantik is far removed from any major grocery stores, we would put in our food order around mid-day, then relax with a private spa treatment followed by a couple of cocktails poolside, while the kitchen team worked their magic and dinner was served. Before bed, we enjoyed an evening swim under the stars, and then drifted off into a peaceful sleep. Floating in Villa Cantik’s pool gazing out to the vast ocean (next landfall is Australia) is like something out of a dream. 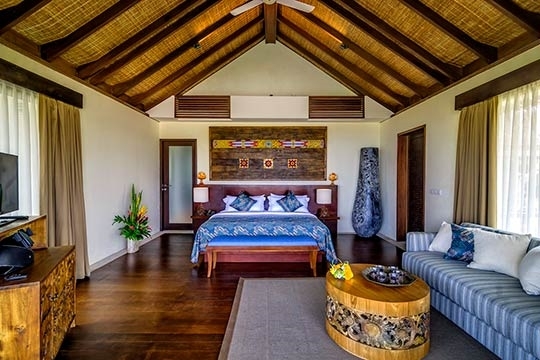 A friendly, qualified staff paired with quiet, starry nights and gorgeous sherbet-coloured sunrises make this villa extra special. Villa Cantik is pretty remote – although this wasn’t really a surprise for us, as it was exactly what we were looking for. A nearby construction site tainted some of our sea views, but went unnoticed most of the time (we visited in June 2017). We thought it was a shame there were no single beds for the kids, and parents with younger children might want to note that numerous corridors and stairwells could pose potential hazards for toddlers. The staff were great. Our family of 10 people really appreciated your kindness and great food. The villa was very enjoyable and spacious for our family. Thank you for making our stay here so memorable. Everything was wonderful, from the home cooked meals lovingly prepared to ensuring that we were comfortable and well taken care off. Amazing view with amazing team. Great service, hospitality and beautiful property. Can't say enough good things. We had a very fun trip. Thank you to all the amazing and friendly staff who helped us with everything. Thank you very much for having us. Amazing villa and lovely staff. Lots of fun memories made this weekend! We have had such a fabulous relaxing stay. We loved all staff, always a big smile on their faces. Nothing ever to hard for them to sort out, so kind. Thanks for making this a magical special week. Thank you very much for having us. It was an amazing weekend. The villa, food and your staff was what we were looking for. Thank you again. We had a wonderful time. Thank you for these days. The villa is so beautiful and we enjoyed it very much. We are looking forward to come here again. I thank you for everything. We are very happy and you prepared everything and always smiled and so kind. The villa we will not forget, it's a very nice place for me and my mother. Everyone was so very happy that they attend the wedding party here in the villa. We do not forget this time at Villa Cantik Pandawa. Thank you so much for making our stay so perfect. The food was delicious and the service was great. Everything was done with lovely smiles! You have made us all feel very welcome and turned Peter's birthday into a very special event. Thank you for this lovely shirt too. Thank you Yoga also for all your help and for sorting everything out for us. Most amazing experience ever! Thank you to the wonderful staff for making our stay incredible. What a great team of people. Hopefully we will meet again soon. We had a lovely stay here with friends. The staff were very friendly and helpful. The food was great and the rooms big and clean. We would come back again. 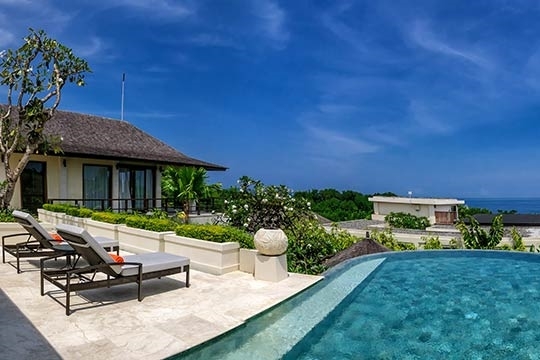 Villa Cantik rests atop a forested bluff on south Bali’s Bukit Peninsula. 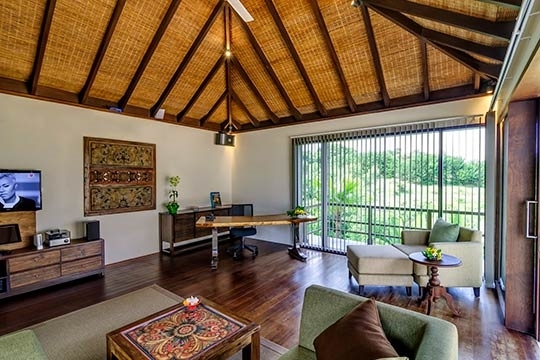 It is part of the newly developed Gapura Vista complex – an enclave of exclusive luxury villas that offer privacy and seclusion amidst stunning natural beauty. 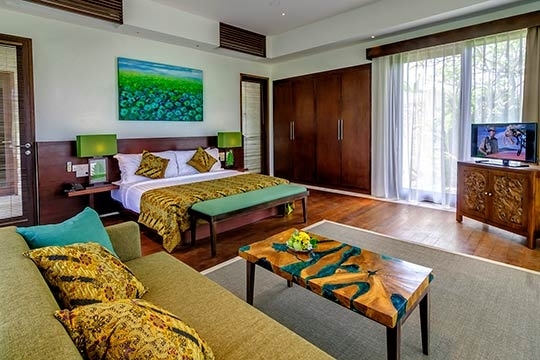 The white sands of Pandawa Beach – an ideal spot for swimming and water sports - are only a few minutes away, whereas the upscale restaurants, boutiques and spas of Nusa Dua are within a pleasant six-kilometre drive. 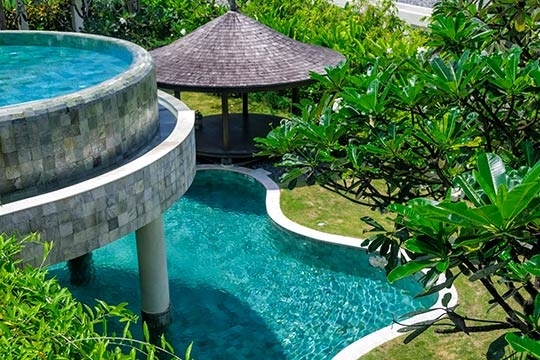 Worlds away from the hustle and bustle of Kuta and Seminyak, guests at Villa Cantik will enjoy natural surrounds paired with stunning panoramic views of the sea. 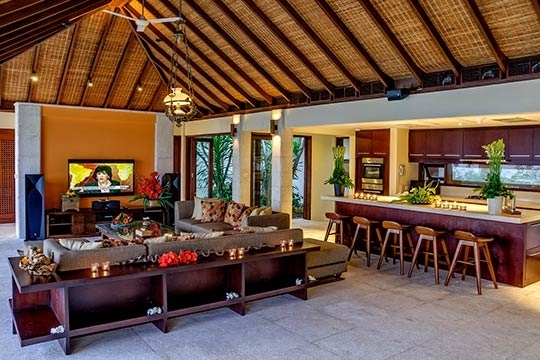 Villa Cantik’s indoor living spaces blend contemporary design with local artwork and unique home accents. At its centre is a sizable living room, guest kitchen and dining room constructed of polished marble with rich wooden features. The living room is furnished with a soft-cushioned sofa, large coffee table and entertainment centre with 60-inch TV with Apple TV. 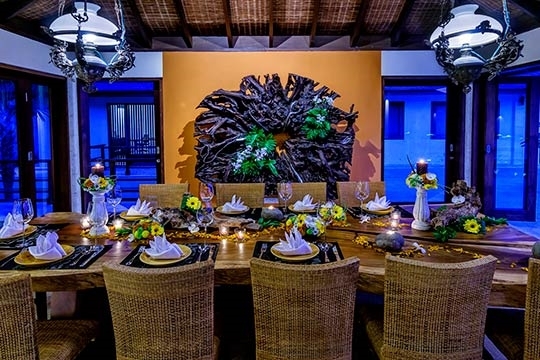 In the adjoining dining room is a rustic solid teak table which seats 12, while the fully equipped guest kitchen has additional bar seating for five. A traditional-styled alang-alang roof combined with antique hanging lamps, three ceiling fans and large folding glass doors keep the entire area well lit and airy. 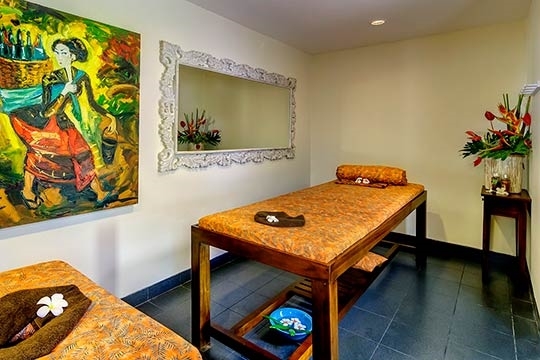 Next-door is a massage room featuring two treatment tables, and a media centre furnished with a soft sofa, armchair and solid teak desk, and equipped with a karaoke machine, sound system and wall-mounted TV. 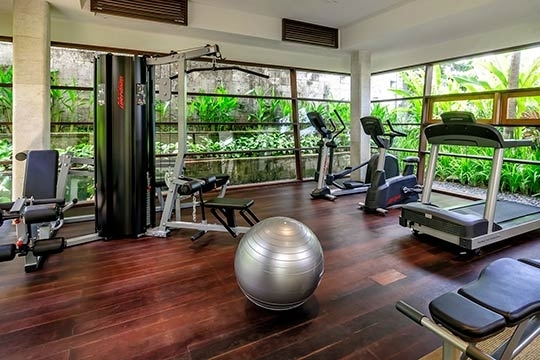 Directly below is the air-conditioned gym with flat-screen TV, Apple TV, sound system, top-of-the-line free weights, cross trainer, treadmill and a multi-purpose weights machine. Villa Cantik’s outdoor living spaces offer stunning 180-degree views of the sea paired with tranquil, shaded garden areas. An 8-metre pool with decorative fire pits defines the spacious upper-level, sun-saturated veranda furnished with four sun loungers and an all-weather sofa. 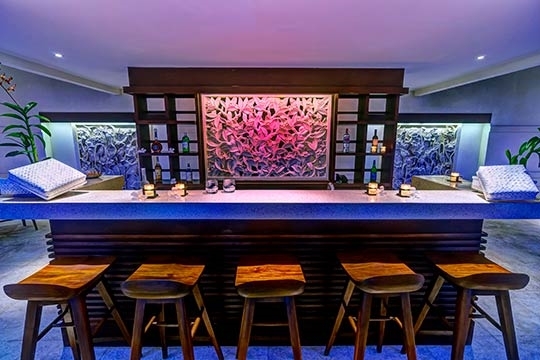 Below is the shaded ground level pool with its shallow end for kids, and outdoor living space that includes a dining table with seating for 20, full-service bar and billiards table. 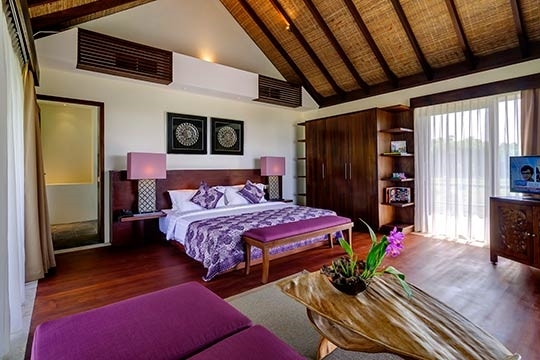 Spread throughout both floors are six air-conditioned, private ensuite bedrooms furnished with plush king size beds. 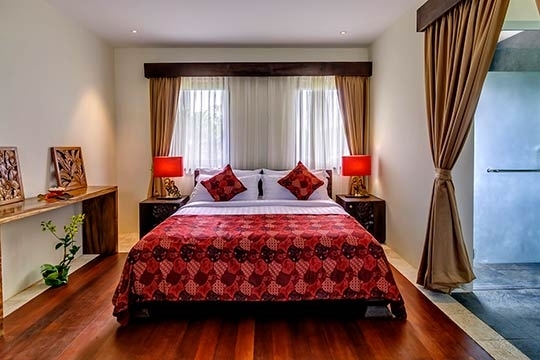 The two master suites are finely decorated with antique furniture and comfortable sofas, and include large walk-in dressing rooms and private outdoor areas. The third and fourth bedrooms are similar in size with additional sofa seating and private outdoor areas. All four rooms are equipped with TV’s. The two remaining ensuite bedrooms are slightly smaller – though still very charming. 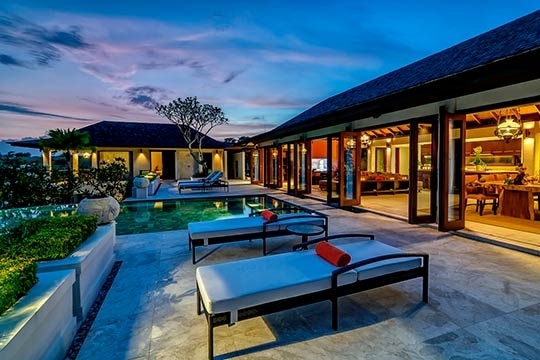 6 bedroom villa located in The Bukit, Bali. Ideal for Beach in ten, Body and soul, Bring the relatives, Going for golf, Room with a view. 9 out of 10 based on 12 user reviews.